Over the last few days I have been working on a case study to try and find out what effect readability has on the ranking of your website. Google allows you to search by readability – scoring pages as having either basic, intermediate or advanced (or sometimes all 3) levels of readability. The traditional view in SEO is that short sentences with less characters or syllables in each word and shorter paragraphs improve readability and therefore rank better. What I found instead is that – Google’s algorithm is now advanced enough to be able to tell what level of readability they should return in the first few results. This means writing appropriately for the age group and education level of your main reader base. My findings also raises the question of whether improved rankings come from the off page benefits. Do people share your work more if it is written for the right audience?Or if it comes from on page benefits. Do Google’s algorithms have the power to know what the average reader wants from their queries? You can search by readability to see for yourself that this is something Google takes into account. Perform a search normally then click on search tools to get a choice of more advanced parameters. It is a good idea when you are researching keywords that you check what the average readability level is for websites already ranking highly for these terms. Google may give a bonus for having a easily readable website, but other factors clearly mean readability is far from the be all or end all of SEO. 1000 searches were made for phrases containing the words “kids”, “children” and “adults” respectively (3000 total searches). The results were very clear. I started searching for “teens” but the results were less clear so I instead did some general searches which backed up the findings. The first group I would search for “… learning materials”, “science experiments for …”, “how to build a boat for…'”, “carpentry for …”. For phrases containing the word “kids” the first natural result almost exclusively seems to match first result for basic readability. Generally the first three results are fairly similar. The 11% of searches for kids where rank #1 was considered an intermediate readability webpage were all searches like “kids on drugs”, “kid’s gun crimes” or other such phrases that kids are less likely to use. These results tend to more closely match the intermediate readability results. For phrases containing the word ‘children’ the first few results again were usually considered to have basic readability. With these there was a bit of overlap with some pages being ranked as having both basic and intermediate readability. Again searches for “children on drugs” and “children gun crimes” tended to have intermediate readability for the first result. For phrases containing “adults” the results were the reverse of what I found for “kids and “children”. This is what you would expect. Adults don’t necessarily want something you would describe as having basic readability. Google is clearly somehow able to tell what sort of readability level fits with what sort of searches which is a good thing, but not something which the SEO world has yet recognised. As the picture says “write for your audience, don’t simplify what you are writing to improve readability”. Practically, dumbing down your work for improved readability will only help if your audience will appreciate easy reading..
To be clear I didn’t just do 1000 searches for kids, children and adults to come to this observation. I also did 850 more more for phrases like “how to build a nuclear reactor”, “how to decorate a room”, “beginner chemistry” ect. The results from these searches backed up my previous findings. You can guess with fairly high accuracy what readability Google will give to #1 search result. Do some searches on the topic of your website and identify the complexity your audience are likely t want. How many characters you use per word or sentence on average. How many words you use per sentence on average. How many syllables per word or sentence you use on average. How much punctuation you use per sentence or paragraph on average. How many sentences you use per paragraph on average. Getting more advanced sans serif fonts (simple fonts without flourishes called serifs) like Arial are considered easier to read and could improve your user experience. Google is also able to identify text which closely matches background colour . If you are writing for kids or trying to make your page more readable use small words and paragraphs made up of simple sentences. If you are writing for adults just remember your audience so don’t try and be over complicated but don’t dumb your text down either. Take the education level of your audience into account as well. The results showed that how to guides tend towards more basic readability so if you blog these sorts of guides it is good to be clear. It is always important to have good spelling and grammar so people can understand you. In the case study it is clear that if you are targeting an audience by age group you should write for that specific audience. If you are unsure then it is less clear. A surprising amount of results Google classifies as having both basic and intermediate readability. Some results (mainly Wikipedia from my searching) were classed as having all 3 levels of readability paradoxical as it sounds. At first I thought this could be Google taking the whole website into account, but not all wikipedia entries are classed as having more than one readablity level. None of the #1 results in my study were given advanced readability. I personally tend to aim for having short sentences so they can’t be misinterpreted. I don’t make such an effort to have shorter words or less syllables because there is usually a right way or phrasing something with an SEO audience. It is possible that Google uses multiple methods of measuring readability which is how some pages can have all 3 levels of readability. At the end of the day everybody has to make their own decisions about what their audience wants to read. Remember you think you want to rank well on Google but what you really want is traffic/business. If you make your text to simple OR to complex you risk hurting the readability for the end user. Getting great readability levels is absolutely vital to a long term search engine optimisation plan, as well as making it easier to engage with your audience by making the text in on your page easier to read. Improved readability can be achieved in the following manner. You simply must shorten sentences and ensure words are less voluminous to get the total syllable count reduced to a more apt proportion, while simultaneously reducing paragraph length and overall structure. 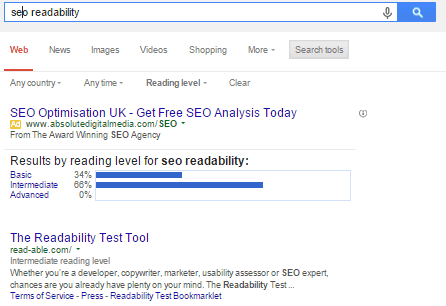 Readability is important for SEO. To improve readability shorten sentences, word length and paragraphs. It is amazing how many people use unnecessary amounts of connectives and long words when they are not needed. Of course this is a very exaggerated example. Sometimes a long sentence is necessary to explain your point. Always proofread your writing or better let somebody else to see if they can understand it. Shorter sentences tend to improve understanding. The main thing this study has shown is that you should write naturally. If you are targeting an audience don’t try and force yourself to improve your readability unless that audience is going to be children. In that case a different writing style is required. This study shows that Google’s algorithm is getting much better at being able to tell what is natural and what isn’t. It is also a clear indication that Google has got very Good at identifying what sort of page it should be ranking highly for which search terms. *Credit to fisicx on UK business forum for the advanced suggestions.